Last weekend we stopped by SilverRock Resort in La Quinta, for some quick birding at the clubhouse lake. In addition to the expected usual species - Ring-necked Duck, American Coot, Mallard, Gadwall, American Wigeon, Ruddy Duck, Pied-billed Grebe, Snowy Egret, Ladder-backed Woodpecker, Verdin, Mourning Dove, Yellow-rumped Warblers - we spotted 7 Canvasback (3 males and 4 females). We also saw two groups of bighorn sheep. Another group of three crossed the road right in front of us, as we were leaving. 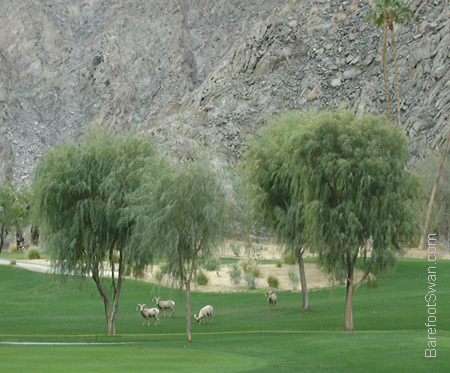 Peninsular Bighorn Sheep (ovis canadensis) live in low elevation areas in our local desert mountain ranges, and populations occur south into Baja California. They were listed as a federally endangered species in 1998. 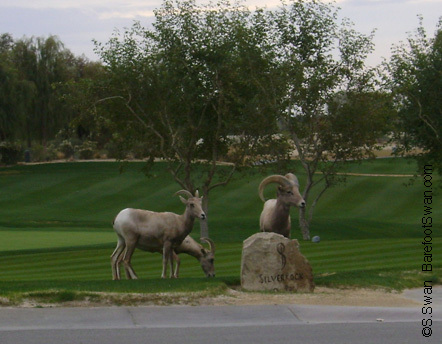 Bighorn sheep are greatly affected by habitat loss and fragmentation, caused by commercial development within their historic range. Natural factors include predation on an already reduced population, lamb mortality, and disease. In urban areas they additionally encounter dangers such as automobiles, poisonous landscape plants, and swimming pools. And in their native habitat research is being done on the presence of humans and dogs on hiking trails, and how that may disrupt bighorn sheep from historic lambing areas and watering holes. 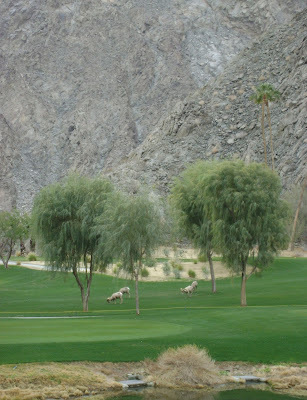 Although it was exciting to see these sheep so close, they definitely do not belong on golf courses. Grass is not a part of their diet and eating it exposes them to pesticides, fertilizer and other chemicals. They are at high risk from predation as they get further away from their steep mountain escape terrain. And exposure to humans makes them less wary, which is also detrimental to their survival. 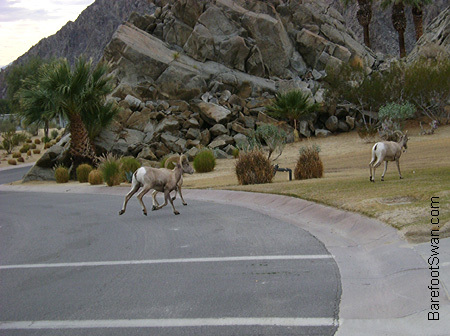 The Bighorn Institute in Palm Desert, CA is dedicated to investigating and researching the decline of bighorn sheep populations, both locally and world-wide. In addition to their research and treatment of sick wild sheep, they also maintain a captive-rearing and wild release program that has been extremely important in expanding our local bighorn sheep population. The El Niño weather pattern has started to bring some much-needed rain to California over the past week. 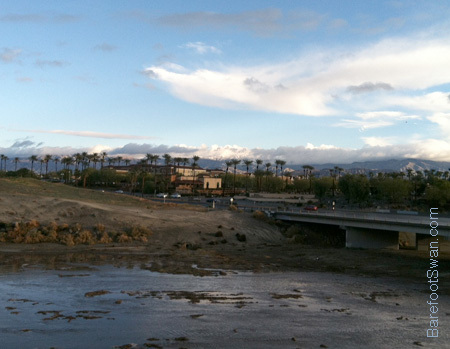 We received more than an inch of rain here in the desert, from three separate storms. 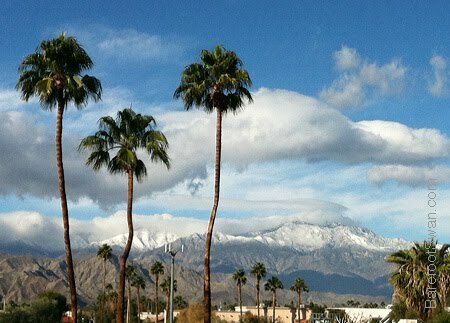 The surrounding mountains received a coating of snow. This is Mt. 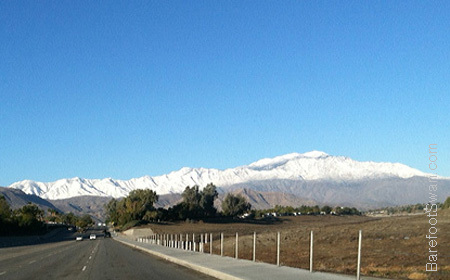 San Jacinto to the west of us (elevation 10,834'). The rains were steady and gentle, and much of it soaked into the soil. The Whitewater Wash had some runoff for about a day (below). This is looking north, towards Joshua Tree National Park. In the center of this pic you can just see snow on the mountains along the south edge of the Park. There were Killdeer calling and running along the edge of the water while I took this photo. Probably glad to find a new bit of habitat, even if it's only temporary. After the last storm moved through, we were gifted with clear blue skies, beautiful snowy mountain views - and overnight lows in the high 30's. "I have never seen snow, and do not know what winter means." ~ Duke Kahanamokou, native Hawaiian and U.S. Olympic swimmer, credited with bringing surfing to the mainland and Australia.